Like most of the most devoted watch collectors around the world, you probably have a costly Rolex watch in your collection. Being the expensive, status symbol that these products are known to be, you need to ensure that your Rolex watch is well maintained and kept safe during storage. This is why you need to invest in the best watch winder for Rolex. Most of the high-end watches by Rolex are known to be self-winding. As such, these watches will automatically wind themselves as you move, provided that you are wearing them (Source). If such a watch is not worn for a while, it will lose its power and eventually stop. With the right watch winder for Rolex watches, you will not have to worry about the watch going dormant during storage. Additionally, you will also need to ensure that the watch is kept in good condition and is safe during storage. While there are numerous watch winders in the market that are designed to do just that, not all of them work for Rolex watches. 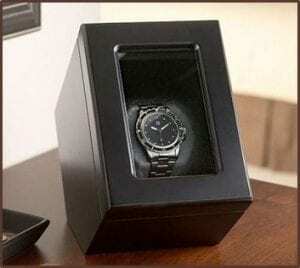 Discussed below are reviews of five of the best watch winders for Rolex in the market. Wolf is renowned for making some of the aesthetically appealing and functional wall winder units available today. As a matter of fact, the manufacturer is one of the best British Luxury leather products company. Over the years, WOLF has been known to produce some of the most beautiful watch winders, jewelry cases and boxes in the world. 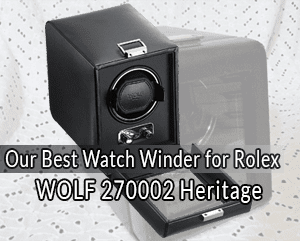 The WOLF 270002 Heritage Single Watch Winder is one such product by a reputable manufacturer. Like the other renowned watch winders by this manufacturer, the 270002 Heritage features 2 rest cycles in between its winding cycles. This design feature is meant to ensure that enough tension is exerted on the main spring of your Rolex watch. Basically, all the winding and rest watch cycles by this product are designed to take approximately 6 hours. After every 6-hour cycle, the unit will automatically get into an 18-hour sleep phase. To prevent your watch from swaying during the winding phase, you should ensure that the straps are securely fastened. The winder applies gravitational force to rotate the rotor within your Rolex watch, hence winding the watch. As such, you need to ensure that the watch is properly positioned within the winder for it to work. Though relatively affordable, the JQUEEN watch winder is one of the most popular winders for Rolex watches today. In addition to its affordability, many users love this product for its silent operation, solid construction and appealing aesthetics. You will also love the fact that this unit is quite reliable; with a defect rate of about 0.1 percent. To ensure a silent operation, the manufacturer uses a Super-silent Japanese motor. The product also offers a great value for your money, featuring a superior design using quality materials. In this regard, the unit is mainly made of acrylic glass and features a piano lacquer protection and copper fittings. You will also find this JQUEEN watch winder easy to operate. In this regard, it offers 3 motor direction settings and several cycle modes. If you are looking for an affordable, yet appealing and functional winder for your Rolex phone, you should consider buying the Brookstone Single Watch Winder. With regards to aesthetics, the unit is made of solid wood and features a simple styling along with an appealing black lacquer finish. This unit is specifically designed to ensure that you do not have to wind or adjust your self-winding Rolex the next time you would like to wear it. In this regard, the winder uses an omnidirectional motor to ensure that your watch remains on time and accurate during storage. Many of its users love the fact that the watch winder is designed to prevent accidental over winding of their precious watches. Would you rather have a more versatile, adjustable and easy to operate watch winder? Well, this Belocia product will be a great choice. Having been designed for winding automatic watches, the product allows you to adjust the direction and turns per day you would like it to deliver. In this regard, it offers five different turns per day settings. 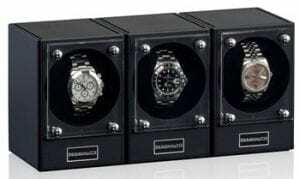 This watch winder is unique in that it is fitted with a touch LCD display for easier operation. If you would like your self-winding Rolex phone to retain its accuracy and precision, you should consider investing in this product. Orbita, an American brand, is one of the leading purveyors of luxury watch winders in the market today. Like most of its other products, the Sparta Bold entry level Watch Winder is designed to give you a beautiful and reliable way of displaying your cherished watch. You will also like the fact that the product features a compact and lightweight design. Rather than using a rotary motion to wind your watch, this winder is designed to sing the watch once every 10 to 15 minutes. In order to simulate the swinging action of your wrist as you move, this product is fitted with a microprocessor. In its functioning, the microprocessor will activate a servomotor, which then sways the watch several oscillations throughout the day. You will also find the aesthetics of this winder to be very captivating. In this regard, the model is made of an aluminum frame and black matte side plates. It is then powder coated for enhanced appeal and durability. Throughout the ages, men have been known to desire fancy, collectible and intricate objects, such as Rolex watches. For many people today, Rolex is a standard symbol for prestige and luxury. As such, owning one is known to give one a sense of accomplishment and class. What few people know about such objects is that they require proper maintenance for them to retain the appeal as time goes by. In this regard, you are going to need a good watch winder for your Rolex watch(s). Normally, some of these products rely on your motion whenever they are worn to wind themselves. Other models have a manual winding mechanism. Regardless of the case, the watch is bound to lose its power during storage and eventually stop. Investing in an automatic watch winder for your Rolex watch will ensure that it remains functional regardless of how long it is stored. With so many automatic watch winders to choose from today, choosing the right winder for a Rolex watch can be a challenge. As you may be aware, not just any watch winder is suited for use with Rolex watches. With regards to design, elegant watch winders feature exquisite designs and more appealing construction. Such products normally go beyond functionality. In most cases, elegant winders take the foam of an enclosed box that is made of high quality materials. As such, they are aesthetically appealing and meant for display on dressers or desks. These are the most basic of watch winders you can buy today. Essentially, functional winders are primarily meant for winding watches. They feature a basic design and often hold the watch on the outside of the unit itself. As such, they are known to be relatively affordable. If you are looking for high-end accessories for your precious Rolex watch, you should consider buying the best extravagant winders. As compared to the other winders discussed above, these products excel in functionality. In addition to automatically winding the watch, these units are designed to keep the watch at the ideal temperature. Some of the extravagant watch winders may have built-in drawers and automatic time display, among other high-end features. Based on the features the winder has, the price of these units vary from one unit to another. However, they are the most expensive of the three winder types mentioned above. In order to keep your watch properly synchronized, you are going to need a winder that is very precise. In this regard, you need to consider the winding sessions the product offers per day, commonly referred to as turns per day. Some of the bets watch winders in the market are known to offer as many as 900 turns per day. In addition to the number of watches a winder can accommodate, you also need to worry about the size of the watches. If your watch is relatively larger, you need to ensure that your preferred watch winder is spacious enough to accommodate it. It is highly likely that you own watches of varying sizes. As such, the right winder should be able to accommodate watches of various sizes with additional mechanisms that are easy to remove and add. Not only should your preferred product be good at winding the watch, it should also be good at preserving your watches. In this regard, PU leather is an important feature to consider. This feature is designed to keep off static and magnetization energies from the watch. Such energies are known to impact negatively on watches. Most Rolex watches are designed to self-wind whenever you are moving. It is the swaying movement of your arm that initiates the process of winding in such products. Keeping such watches powered and on-time during storage is not easy. However, the right watches winder will make this easier for you. With the various considerations and reviews discussed in this guide, choosing the best watch winder for Rolex should now be easier.